Once a child has completed a level of the phonics interactive game, what could be better than a story to read that focuses on the phonics words he/she has been learning? The National Curriculum recommends that at Key Stage 1 children ‘read books consistent with their developing phonic knowledge and skill’ and the Department for Education advises parents to use ‘decodable readers’. 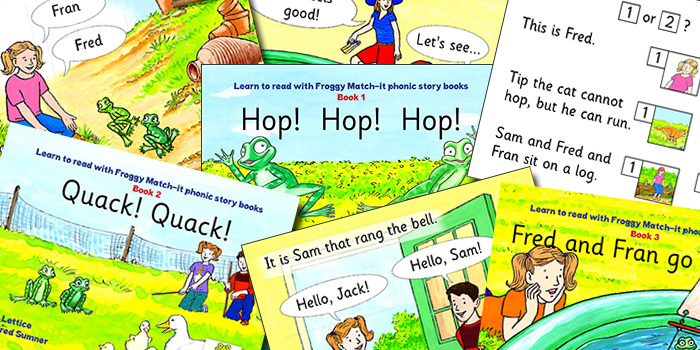 The Froggy Match-it ‘learn to read’ game helps children to develop good phonics skills: the e-reading books reinforce these skills, giving children confidence and helping them to develop a love of reading. Phonics is taught because it is an effective way of learning to read. With Froggy Match-it e-reading books, children use their phonic knowledge to blend sounds and decode words and read ‘for real’. The e-reading books feature two lovable frogs, Fred and Fran, and follow their adventures. Each beautifully illustrated book is designed to fit in with a particular level of the game and uses the same sort of phonic words, ensuring children can work out almost all of the words themselves. The first book, which complements level 1 of the main app and also the free app, is called Hop! Hop! Hop! In the story, Fred and Fran come across a rather hungry cat: trouble ensues! The words used in this e-reading book are three-letter medial short vowel words, often called c-v-c words: words such as cat, sun and log. These are the same sort of words that are used in level 1 of the game, and in the free app, ensuring children who have successfully played the game will be able to read the book themselves, with confidence. This is a huge step for a child learning to read. Hop! Hop! Hop! is available now, priced £1.99, from Amazon. Read it on your Kindle or use the Kindle App on your tablet. Buy Book 1: Hop! Hop! Hop! Quack! Quack! is ideal for children who are working on short words which have double letter endings or have sh or ch in them. Example words are bell, mess, duck and shop. Quack! Quack! is the second book in the series, and the story sees Fred and Fran making some feathery friends. Quack! Quack! is available now, priced £1.99, from Amazon. Read it on your Kindle or use the Kindle App on your tablet. Buy Book 2: Quack! Quack! Fred and Fran go Sailing is aimed at children who are learning about sounds that we spell with ai, ee, oa or oo. Examples of the words used are rain, deep, boat and pool. Fred and Fran go Sailing is the third book in the series, and the story sees Fred and Fran having a watery adventure. Fred and Fran go Sailing is available now, priced £1.99, from Amazon. Read it on your Kindle or use the Kindle App on your tablet.